Smartphone and Tablet in India is spreading like Viral and the Manufacturer XOLO has launched Xolo Play 8X-1100 Smartphone at ₹14,999. 1.7 Ghz octa Core Processor. Having high-definition IPS display is scratch resistant and made with coring Gorilla Glass 3. Android V4.4 KitKat OS coupled with assisted GPS. 13 MP rear Camera has a flash support and having Exmor RS Sensor feature. 2100Mah Battery with charging time of 3 hours. 16 GB internal memory, 2GB RAM and expandable memory up to 32 GB. 5MP front rear Camera sports a BSI sensor and 88 degree wide view angle. 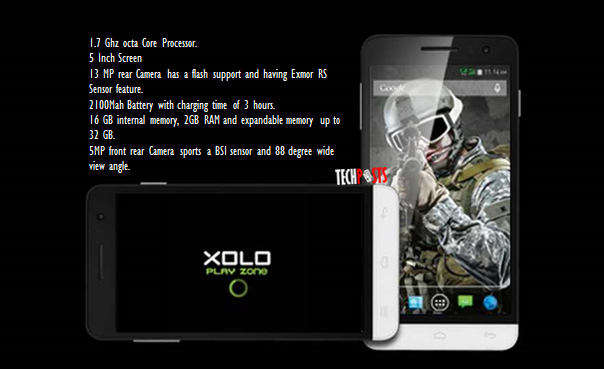 You can buy XOLO Play 8X-1100 from Flipkart and Snapdeal. Also available on other E-Stores.